Writing: A Gift or a Hard-Gained Skill? Writing—not speaking, reading or listening—is the most complex aspect of language learning skills. Writing is a talent which not everyone is endowed with. Writing is best done by the students of language or those in the Arts, and blah-blah-blah. Often one hears statements like these. No doubt writing is not a piece of cake, but it is neither a gift nor, with apologies to Niyi Osundare, an esoteric whisper for any coterie. As you are able to read this article, you also can write and write a well-composed piece. Yes, you. An award-winning American cognitive scientist, Steven Pinker asserts in his book, The Sense of Style that “Writing is an unnatural act”. He further quotes Charles Darwin who observed that ‘Man has an instinctive tendency to speak, as we see in the babble of our young children, whereas no child has instinctive tendency to bake, brew or write’. I can’t agree more. Language is acquired by a chinld and not learned; but no child acquires the ability to write. Writing is learned, often through a tedious drill and practice. There’s no theory I know, even an implausible one, which says writing is innate as in Language Acquisition Device (LAD) supposition on speech in our brains. All those seasoned writers learned it. Thus, you also can. I had no interest to write, or to become a writer in my childhood. Like many other children – not however of today who probably dream to be governors, senators or some politician – I cherished to become a medical doctor. Unbeknown to me, Allah had a better plan for me; I am now a university teacher. I grew up with a definite desire to read and own books. My father has a mini-library at home. He doesn’t patronage any majalisar hira (in-group), though he maintains good ties with all. His books are his best friends. I picked up writing while at secondary school. I used to read novels of James Hardly Chase, Sydney Sheldon, many African writers, newspapers, magazines and everything that comes my way. I swallowed much and then I began to write poems, short stories and essays. It was like an emission, if you will. A few days ago, two friends disclosed to me that they crave to write ‘as I do’. In a separate happenstance, I asked another friend to write about his life in Cyprus, where he currently studies. He responded thus: “I also would like to write but honestly, Malam I don’t feel like I have the gift”. Sincerely, I don’t count myself among writers; that I nevertheless yearn to do sometime soon, in sha Allah. I believe that these friends possess the potentials to learn about writing, perhaps better than I. A mental indisposition called “writer’s block” might be responsible for their procrastination. They only need to put their head and heart to it. Nothing is un-learnable. We should not, on the other hand, forget that as we are individuals, thus our writing skills cannot be the same. Some people are naturally brighter and quicker in learning than others. Thus, you may learn about writing but not perfect it as your friend, brother or mate. Likewise, you may not be able to exactly emulate your particular favourite writer. 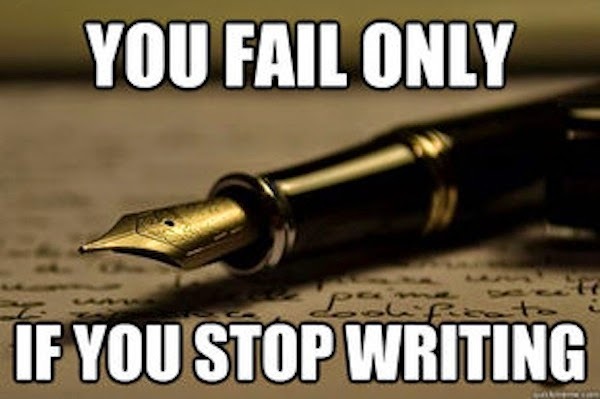 That doesn’t however mean your writing is a failure. Aspiring writers are pertinently advised to write and rewrite till they write it right. Another scholar suggested that the starting point for becoming a good writer is to be a good reader. You must do extensive reading (ER), Prof. Aliyu Kamal of Bayero University, Kano would always tell us in class, before you write. I read any good prose within and outside my field of studies in order to acquire their technique through, what Pinker describes as, “spotting, savouring and reverse-engineering examples of [the] prose”. For instance, a ‘senior’ friend of mine from University of Maiduguri, doing PhD in Veterinary Public Health here in India knows the grammar of English and writes far better than numerous graduates of English I know. Therefore, read all genres from religion to politics, science and technology to film and arts, et cetera. The Internet avails us with a great deal of access to the world’s top newspapers, media houses, blogs and so on. I write and rewrite, proofread and then publish on my blog. My writings have appeared in numerous newspapers in Nigeria and elsewhere. I used to fear correction and criticism from my teachers, mates or even students. But I never let that dispirit me. After all, nobody is perfect.